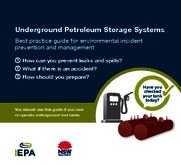 Underground petroleum storage systems (UPSS) can leak, potentially contaminating the surrounding land and groundwater. This can create risks to both human health and the environment across NSW. UPSS are most common at service stations but may be present where fuel is stored and/or used such as at marinas, work depots, golf courses, airports, car dealerships and certain government facilities. By protecting soil, water and air quality from the risks of leaking UPSS, the community benefits through better health and improved land use opportunities. There are also business benefits for the person responsible for a UPSS through reduced product losses and liabilities for clean-up costs and damage to impact on land values. The EPA currently regulates the operation of UPSS infrastructure in NSW. However, regulatory responsibility will be transferred to local councils on 1 September 2019. See Protection of the Environment Operations (General) Regulation 2009 - Clause 91 Underground petroleum storage systems. The Protection of the Environment Operations (Underground Petroleum Storage Systems) Regulation 2014 (the UPSS Regulation) commenced in 2008 and was remade in 2014. It focuses on minimising the risk to the environment and human health by requiring best practice design, installation and ongoing maintenance and monitoring of UPSS in NSW. The EPA is the Appropriate Regulatory Authority (ARA) for any matter arising from the UPSS Regulation until 31 August 2019. Local Councils will assume ARA responsibility from 1 September 2019. Leaks from UPSS are a major environmental problem and can have impacts that are costly and time consuming to fix. The EPA has developed a self-evaluation program to provide service station operators with a quick and simple way to review their compliance with environmental requirements for UPSS in NSW. Service station operators who participate in this program are more likely to identify issues and take the necessary actions to correct them before they develop into major environmental problems. The EPA and key industry bodies, such as the Australasian Convenience and Petroleum Marketers Association (ACAPMA) and the Motor Traders’ Association of NSW – Service Stations Association, encourage all service station operators to participate in this program. It only takes 5 to 15 minutes to complete and could save you an expensive clean-up or compliance issue. The person responsible for a UPSS is the person who has ‘management and control’ of the system. The person responsible must ensure that they have procedures and systems in place to detect and manage any leaks as early as possible and document these in an Environment Protection Plan (EPP) specific to the premises. It is against the law to allow or ignore contamination resulting from a leaking or faulty UPSS. The person responsible for the UPSS has a duty to notify pollution incidents immediately and must then complete the UPSS Regulation leak notification form (DOCX 46KB) and provide it to the Appropriate Regulatory Authority within 30 days. The EPA advises that all Exemption Orders previously issued by the EPA under Classes 2, 3 and 4 that provided exemption to the person responsible have now expired. This means that all UPSS should now be operating in accordance with the requirements of the UPSS Regulation. The EPA’s regulatory responsibility for the UPSS Regulation transfers to Local Councils on 1 September 2019. This date coincides with the statutory remake of the UPSS Regulation. ensuring councils have the knowledge and capacity to supervise fuel storage activities. The EPA will have an ongoing role with UPSS regulatory issues after 1 September 2019. The EPA will provide support to councils undertaking their regulatory functions, maintain and update guidance material and actively work with public authorities with UPSS on site to ensure compliance with regulatory requirements. The EPA is committed to improving water quality in NSW through innovation and the application of best practice strategies, technologies and management approaches. In response to local council and industry need for guidance, the EPA has developed the draft Practice Note – Managing run-off from service station forecourts (PDF 370KB). The draft Practice Note proposes a risk based approach to the management of service station forecourt run-off, including the application of innovative options and technologies. It extends available options for managing service station forecourt run-off to include water treatment and discharge to the stormwater system. It also encourages local councils to assess, on a case-by-case basis, the receiving environment, water quality, and treatment solution proposed. The NSW EPA is inviting industry, government stakeholders and the public to have their say on the draft practice note. Comments and feedback received will inform the finalisation of the practice note. Please note in your submission if you would like to receive further information about this reform and if you represent an organisation. The EPA will publish all submissions received on the EPA website, unless requested to keep a submission confidential. The EPA will review each submission and prepare a submissions report summarising the issues raised and any changes proposed to the draft Practice Note. The submissions report will also be published on the EPA website. This self-evaluation has been developed to provide service station operators with a quick and simple way to review their compliance with environmental requirements for UPSS in NSW. (02) 9016 9031 Managed by the Motor Traders Association of NSW (MTANSW) as an independent service for all operators who have underground tanks.